The ukulele is a wonderful and versatile little instrument, and I’m passionate about helping people get the most out of it! Ideally you’ll have been playing for a little while and have learned a few chords, now you’re ready to take the next step to develop your playing. We’ll be learning some songs while focussing on some important aspects of uke playing: strumming, picking, chord shapes and embellishments and other fun stuff to enhance your playing. Afterwards we’ll do a short performance to friends (possibly in the local café) to round off the workshop! Stephen Wragg is a longtime ukulele enthusiast. He founded Ver Players a large community ukulele group which has been running for over 6 years. He composes, writes his own songs and plays with folk indie band Rag House. 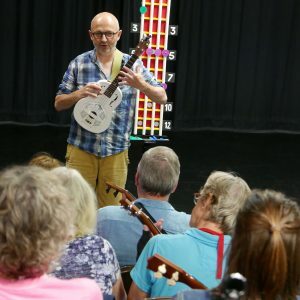 He also teaches in St Albans and gives ukulele workshops at uke and folk festivals, most recently at GNUF – The Grand Northern Ukulele Festival.